Nominations are now open for Tampa Connection’s Betty Tribble Award. 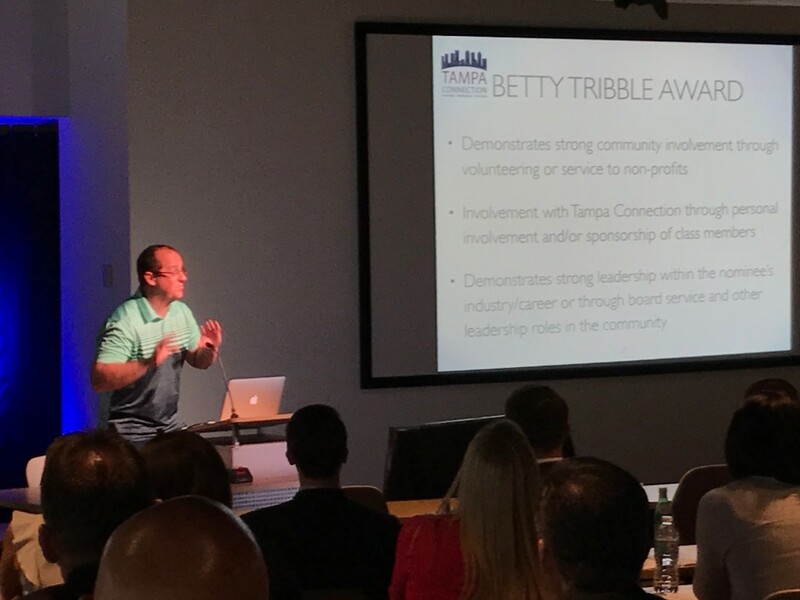 This award, named after its first recipient, longstanding Board Member Betty Tribble, is a way to honor former class members for their community involvement, continued involvement with Tampa Connection, strong leadership and the other outstanding accomplishments that we have come to expect from our alumni. Nominees can be from any class and we encourage all class members and alumni to consider who they may know who best embodies the principles of Tampa Connection. Please use the form below to nominate a Tampa Connection alumni whom you think possesses these qualifications and has made an impact on our community. Please feel free to communicate with your nominee so that you can include as much relevant information as possible to support your nomination. Completed nomination forms can be emailed to our administrator at Administrator@TampaConnection.org and are due by May 11, 2018. Dave Burton, 2017 Betty Tribble Award winner.